U.S. Secretary of State Rex Tillerson, center, poses with ASEAN foreign ministers before a working lunch at the State Department in Washington, U.S., May 4, 2017. The United States is rallying Southeast Asian countries to advance Washington's approach to address North Korea's threats and to uphold principles including freedom of navigation in the South China Sea. Secretary of State Rex Tillerson, in his first meeting with all members of the 10-nation Association of Southeast Asian Nations (ASEAN) on Thursday, asked the bloc to speak in one voice to tackle North Korea's nuclear and missile proliferation. “Very specifically, the U.S. is asking countries, including our partners in ASEAN, to take efforts to deny the revenue streams that North Korea has enjoyed around the region, and to take a look at the diplomatic relations to minimize them,” Patrick Murphy, deputy assistant secretary of state for Southeast Asia, said in a telephone briefing on Thursday. “So that North Korea does not gain benefit from its diplomatic channels for its nuclear and missile aspirations,” Murphy added. All ASEAN members have diplomatic relations with North Korea. Eight of them host North Korean embassies and five have embassies in Pyongyang. Secretary of State​ Rex Tillerson shakes hands with Indonesian Foreign Minister Retno Marsudi, May 4, 2017, at the State Department in Washington. Washington said there was a shared concern among the Southeast Asian bloc that North Korea's provocation has threatened the stability and peace in the Asia-Pacific region and around the globe. Some countries have told the U.S. they “are taking measures and steps, relooking (at) the size of North Korea's diplomatic presence in individual countries, their activities, their commercial transactions that are conducted under diplomatic cover in the light,” Murphy said. On the South China Sea, Secretary Tillerson made a particular appeal to his counterparts that all parties involved to “stop militarization, construction and reclamation of land in the South China Sea area” while talks are going on. FILE - In this April 21, 2017, photo, an airstrip and buildings on China's man-made Subi Reef in the Spratly chain of islands in the South China Sea are seen from a Philippine Air Force C-130. “The secretary and the ministers stressed the need for ASEAN member states and China to ensure the full and effective implementation of the Declaration on the Conduct of Parties in the South China Sea in its entirety, and took note of efforts towards the early conclusion of a meaningful Code of Conduct in the South China Sea,” Nauert said. In 2002, China and ASEAN adopted a declaration of conduct in which all parties agreed to avoid activities that would escalate disputes, including refraining from inhabiting the presently uninhabited islands, reefs, shoals, cays and other features. However, a legally binding code of conduct has yet to be worked out. In Beijing, Chinese Foreign Ministry spokesperson Geng Shuang said the South China Sea issue is neither a problem between China and ASEAN, nor between the U.S. and ASEAN. A week ago, leaders from ASEAN sidestepped criticizing China over its expansion in the disputed the South China Sea, in a mildly worded statement after the summit in the Philippines. Philippines President Rodrigo Duterte gestures while addressing the media following the conclusion of the 30th ASEAN Leaders' Summit in Manila, Philippines, April 29, 2017. The top U.S. diplomat planned to visit the Philippines in August to attend several ASEAN regional meetings. 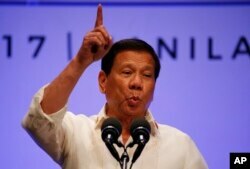 This announcement came after the White House was under fire for inviting Philippine President Rodrigo Duterte to the U.S.
Duterte has been scorned internationally for his war on drugs, which has featured the extrajudicial killings of thousands of people. ASEAN will celebrate its 50th year of existence. The U.S. and ASEAN will celebrate a concurrently 40-year anniversary of relations. Founded in 1967, the ASEAN bloc is America's fourth-largest export goods market. Washington established its relations with this bloc in 1977 through the ASEAN-U.S. Dialogue. The U.S. and ASEAN also share nearly 100 sister city or sister state partnerships.